The Board of Directors of the Canadian Motorcycle Hall of Fame is pleased to announce the seventh member of the Class of 2018. Rick Hobbs will be honoured at the 13th Annual Induction Banquet and Reunion which takes place November 17th at the Delta Hotels Burnaby Conference Centre in Burnaby. Rick grew up around motorcycles and cars. His father raced in the 1950’s and had motorcycles when he was young. Rick loved to clean his Dad’s bikes and pretend to ride them, Dad noticed and brought home a Suzuki step-through 50cc. After many moves across Canada they settled in Whitehorse, Yukon when Rick was 12. He got another motorcycle (Kawasaki 100cc) when he was 14 and spent many hours riding, racing and repairing. Rick worked in his father’s body repair shop part time after school then full time when he finished high school. His dad noticed that his heart wasn’t in the job and encouraged him to go to motorcycle repair school. After completing school, got a job at Vancouver Suzuki as service manager. Gary Goodfellow owned the shop, was just starting to do some roadracing and needed help at the track preparing the bikes. Rick volunteered and spent many evenings at the shop and weekends at the racetrack, learning and trying to improve the bike’s performance. He loved it. Later Rick connected with Tom Walther. Unfortunately, Tom passed away from racing injuries. Rick had moved to Toronto in anticipation of Tom racing for Suzuki Canada in ’88. He took a job at McBride Cycle in Toronto, then began working for Art Robbins on a part time basis. When Art retired from racing, Rick worked for Paul MacMillan on the Ciampini Racing team to finish out the ’88 season. Still working at McBride Cycle, Rick was also working with Steve Crevier, whom he had known from his time in Vancouver. Steve Wyatt and he worked together on Steve’s 3 racebikes and had the good fortune to win all 3 Canadian RACE National Championships, a dream season! The following year Rick worked for Michel Mercier on another Yamaha OWO1 Superbike, Michel won the RACE National Superbike championship for ’90, then retired. 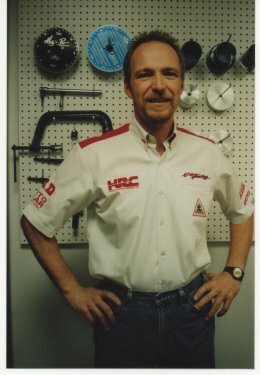 Rick stayed with his FAST racing team working with Linnley Clark and winning the 600 RACE National Championship 2 years in a row and just missed out on the ’92 Superbike title by a couple of points. Rick returned to California and continued working with the top championship winning riders to this day.